Snow Owl 6.0 was focusing on various improvements and the addition of a number of new features as well. Due to underlying technology updates and large-scale improvements the version number was bumped from the expected 5.5 to 6.0. Whether you have already created a query type reference set to store your queries, or you are just about to get started, you can easily create intensional reference sets using a simple wizard. The wizard can be launched from the Reference set navigator by right clicking on the Query specification type node, or selecting and right-clicking on an actual Query specification type reference set and selecting the New query member context menu. The first page requires to enter a query expression using the Expression Constraint Language. Alternatively, already edited queries can be browsed from the workspace. On the second page, if the user has not yet selected a query specification type reference set to record the queries, an existing refset can be selected or a new refset can be created by entering its pereferred term. For those simple type reference sets where the members are populated from a query (intensional reference set), the refset editor has an additional tab displaying the query itself. The query is read-only. Intensional reference set members can be updated by re-running the query that was used to populate the reference set members. The update action can be invoked from the simple type referense set editor’s toolbar or from the query type reference set editor’s toolbar. When updating the query type refset, all member queries can be updated at once. The UK Edition of ICD-10 can be imported from the UI by selecting the ICD-10 UK Import wizard at File>Import. Similarly to other ICD-10 versions, the classification can be navigated in a hierarchy view. The navigator is decorated with the UK flag to easily identify from other national ICD-10 variations. The hierarchy can be filtered by label or code. Double-clicking a component in the hierarchy view or selecting it in the search view opens the read-only editor. Besides the hierarchy filter ICD-10 codes can be looked up using the quick search widget or the advanced search. OPCS-4 import is assisted with an easy-to-use import wizard, where only the source file location has to be selected. OPCS-4 codes can be browsed with a hierarchical view similar to other terminologies. A tooltip in the navigator helps browsing with additional information. Each top-level chapter is assigned a dedicated icon to ease identification throughout the application. OPCS-4 codes can be opened in a read-only editor by double clicking on them. The editor displays additional metadata about the codes. The built-in quick search widget is searching across OPCS-4 codes as well. Validation within Snow Owl is executed on many levels. During import the syntactic correctness and the referential integrity of the RF2 files are checked. The concept hierarchy is also validated to avoid loops. During the concept authoring the editor is validating FSN uniqueness and attribute conformance to the Machine Readable Concept Model. During classification the ontology consistence is checked and equivalent concepts are detected. For QA rules that are not covered in the above three validation methods a manual validation system has been implemented. Validation rules are based on the Expression Constraint Language, and as such, they are executed on the inferred hierarchy. Click the icon to run validation. Validation is always executed on the active branch. 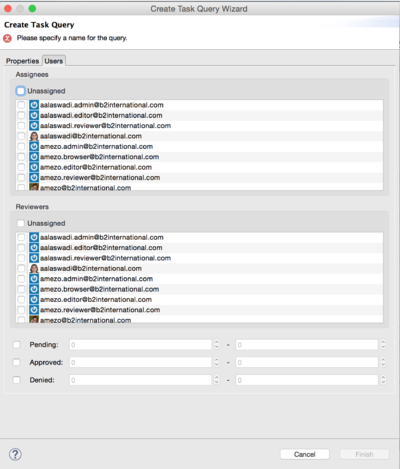 Components that fail validation are listed in the Validation Issues navigator, grouped by severity and rule number. Double-clicking a component opens it in the concept editor. Task query has been enhanced with the ability to query on the number and the status of the reviews that are associated with a task. This enables the creation of task groups for first and second review.